There hasn't been ice on the canal in four years. For nine-year-old Moonta, who was sick that last icy winter, it has been four long years of waiting to learn to skate. When the canal finally freezes over, Moonta is eager to make up for lost time. As he tries to catch up to his classmates, however, Moonta's desire to become a great skater overnight begins to cloud his judgment and he finds himself in a number of difficult and increasingly dangerous situations. This book is both an engaging portrayal of the culture of a specific place and a universal tale about patience, humility, and persistence. Moonta's predicament of not learning to skate with his peers immediately establishes him as a sympathetic character, and the understanding that the ice may be short-lived, or might not come again in the near future, gives the events of the story a strong sense of urgency. The weather, too, is described so well that the reader truly understands how cold it is on the canal, and how the ice feels beneath Moonta's skates and the little red chair he uses to help him balance. Though the story is told from Moonta's perspective, there are a lot of wonderful supporting characters whose own flaws and personalities also come across very strongly. Particularly appealing are Moonta's headmaster who is stern in school but childlike on skates, Moonta's mother and father, the champion skaters of his village, Moonta's grandfather, who has been waiting these past four years for what is likely to be his last skating adventure, and Aunt Cora, who never learned to skate at all. The way these characters react to the arrival of ice on the canal after such a long time contribute to the reader's understanding of how joyous an occasion this is for this community. Because the adult characters also love to skate (or regret not learning how), it is also easier to forgive them when they are hard on Moonta, because the reader can see that, deep down, they truly do understand his desire to get four years of skating into just a day or two. Far Out the Long Canal is a great winter read. 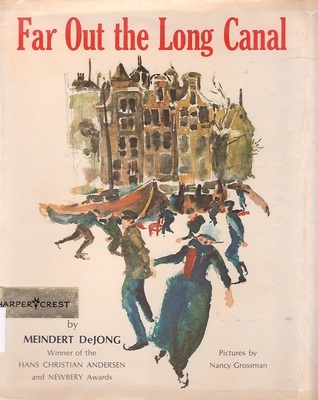 I enjoyed it even more than DeJong's The Wheel on the School and found it just as quick and cozy a read as A Day on Skates by Hilda van Stockum, which is similar in content, but different enough that reading both books does not feel tedious. Suggest this book to readers - especially boys - who like non-fantasy adventure stories and winter sports. I remember reading this book! I was also in Holland one year when the canals froze, so got to see the big race.